This small facility is located in a now passive volcano that’s around 1 km in diameter. The crater’s walls hide this small hideout with a landing pad. 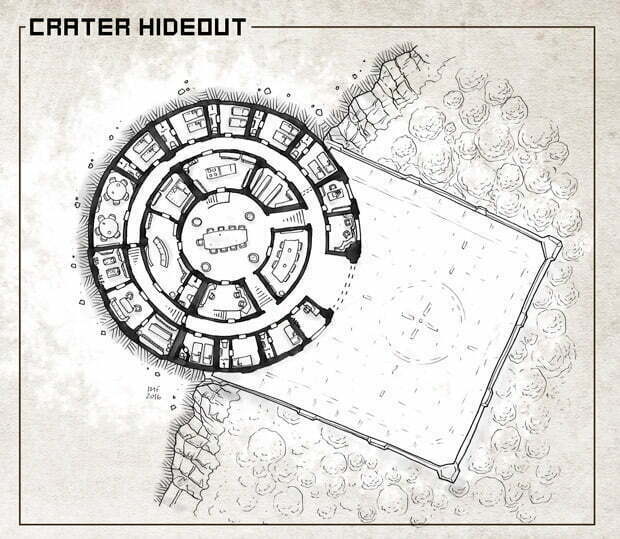 The hideout has enough room for bodyguards and servants in addition to the luxurious banquet hall at the center of the complex and a separate section with a suite, armory and a secret food supply for prolonged stays. I designed the entryway so, that possible attackers would not be able to attack straight into the central hall or the suite, but there but be multiple corners and turns for the defenders to take cover. Also, the dotted lines mark emergency bulkheads that can be lowered when needed. This map was originally published on Patreon with the support of my awesome patrons in November 2016.